The great ride is just why the Powell's were made for adults and did so well off road. I had a 14 year old young boy who raced for my store on a Powell his name was Bruce Zigler and he sure could ride that bike. Have a lot of fun on your new Powell it looks great. My heavens.....that thing is sweet !!!!!! Congrats !!!! Just went thru this whole tread! for any serial # ? Time to add another Powell 7011-MO. Seems the number is lower than the M model shown above, so it was made before Sams model M. I really don't know the difference between the M and Mo. But the frame on this one is the same as the two Phantoms I have. Same longer swing arm for more travel, and longer travel forks than the challenger bikes. Just picked up a Powell in the Albuquerque area. Number 1126-B. It a rough roller, but I've been told that the majority of it is there. I didn't realize the following of these minis until I started researching them. I know what you mean. 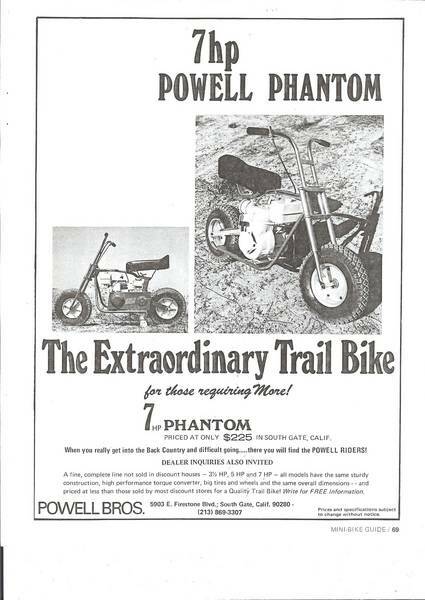 I've always wanted a Powell mini bike since I was 7 years old and that was 50 years ago. I came across mine by pure luck and joined this site for information on Powell's. When I found out how popular they are with people on this site I was glad I wasn't the only 7 year old that wanted one back in the day. Mine was a total wreck also but the folks on this site got me motivated and excited to restore it, so a kind of sickness took me over and I restored mine in about 1 month. My wife was glad I finished it so she could see me again in the evenings. It's just as fun to ride as restoring it and talking with the folks on this site. It has an actual tc driven. Not sure on the model. Any help would be great. Nice score Karl ! :thumbsup: I think its a Challenger...but not 100 percent sure. Mine was a 6899-MO, it was originally blue and was decaled as a challenger with the bread loaf seat. If you search this thread there was some info from the Powell's that BAB had got concerning a bike that another member got that was an MO, It just showed in their paperwork as being the "new model" that serial number was a little lower than mine and was later 1971. Did not state engine size, but the one they got the number and info from had a 3.5 on it. I am not sure what mine came with for an actual engine, only thing I could get from the guy was the engine had an Indian on it and had a funky box looking muffler. That could mean an HS or medium frame H as I think they used the taylor spark arrestor on the 3.5 becuase they actually fit the bike off the shelf. I was pretty sure it was a Phantom Karl. There was some of the original blue paint showing on the bottom of the motor plate. The MO definitely put it in the right time frame as a Phantom but I don't think anyone ever really got the info on the MO bikes. There have only been a few show up in the time I was digging around. As for the driven, I was never 100% sure it was the original but when the guys were talking about it at Windber two years ago they seemed to think so. The teeth were good on it Markus. If you can find out what the driver is supposed to be maybe I can help you with that. I'm still digging through stuff. Hi, I'm a new member to the forum. Are you still accepting serial number requests? Where do I post questions about where to get wheels, tires, and governor/carb linkage questions. Thanks.